Looks like America is going to have to start sharing its favorite pastime with a couple of vengeful ghosts. The stars of The Ring and The Grudge laced up their cleats and hit the field of Japan’s Sapporo Dome yesterday to promote their horror cross-over film Sadako Vs. Kayako. The two were in attendance for a ceremonial pitch to open up a game between the Hokkaido Nippon-Ham Fighters and the Yakult Swallows. 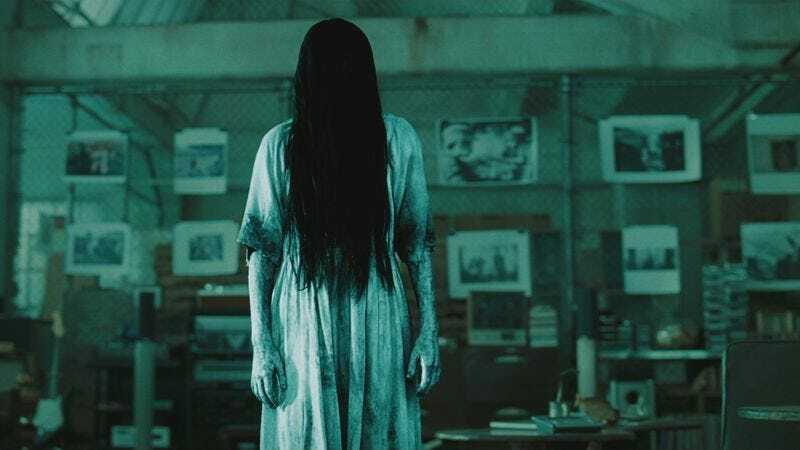 This event comes in a line of other promotional activities, including the release of Sadako and Kayako beauty masks and a particularly terrifying Instagram account. Sadako, dressed in her infamous white nightgown with her face completely obscured by hair, and Kayako, assisted by her ghost son Toshio—wearing in a very adorable “I <3 Kayako” T-shirt—trudged and flailed onto the field without once breaking character. Sadako winds up like a pro, even nodding and signaling (possibly cursing) at the catcher. Kayako cracks the ball hard into left field and starts to run toward first before quickly collapsing and writhing into the grass. Sadako falls to the ground as well while Toshio proudly runs the bases for his mom, his arms raised up in the air. Sadako Vs. Kayako opens on June 18. We’ll probably see them before then. They’ll make sure of it.